The “SmartFinger” is a new type of tactile display for AR which is worn on the nail side of the finger. 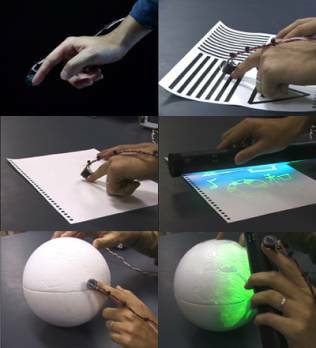 It does not inhibit our tactile sensation, since the ball of the finger is naked and we can feel the environment directly. The absence of any material between the object and the finger is a critical aspect of this design. The “SmartFinger” can provide extra tactile sensations. For example, someone wearing this small device on his or her nail can touch a drawing on a flat sheet of paper and feel a virtual edge along the drawing’s line, and virtual roughness from its texture pattern. This is a wearable device for AR, which adds bump mapping information to real surface objects using existing printing techniques. We propose a small, wearable tactile display composed of three components: (1) photo-detectors to measure the changing environment beneath the finger in real-time, (2) a sensor to measure change in the fingernail’s color from the nail side and detect the presence of external force, and (3) a “voice coil” to generate vibration on the nail, in order to realize various tactile sensations corresponding to these two types of sensory information.